Add a touch of Australian native wildlife to your garden with this cute little kangaroo joey. 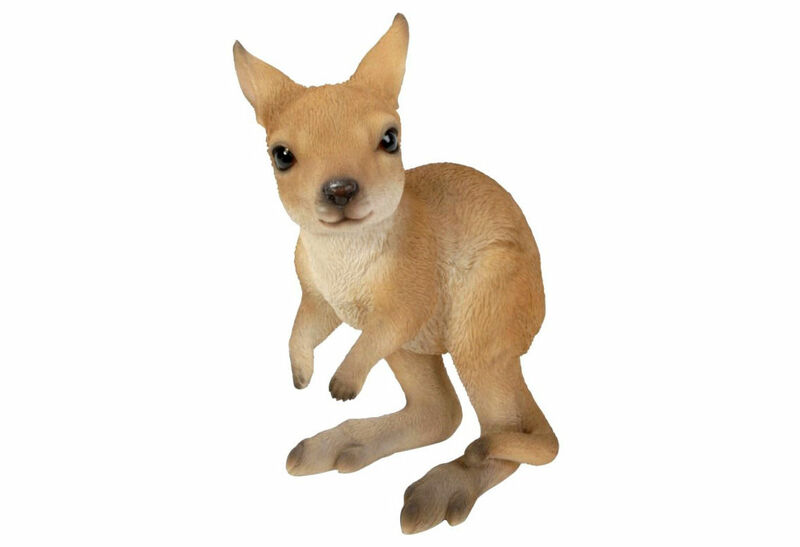 This adorable little joey will add character to your garden or the inside of your home. It would make a great centre piece for your garden. Combine any or all of these realistic wildlife species together and create your own Australian wildlife scene. The kangaroo is one of Australia’s most iconic species. There are over 60 different species of kangaroo and their close relatives. The kangaroo belong to the family of macropod which means ‘great footed’. Kangaroos of different types live in all areas of Australia – from the cold climates and desert areas, to tropical rainforests and even beaches. 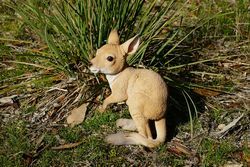 When a joey kangaroo is born, it is tiny, pink and hairless and under - developed. It climbs its way through the fur of her abdomen and into her pouch. The joey will then spend around 7 - 8 months living and growing inside her pouch. It's around that time that the joey then becomes active outside the pouch. It's around this time that the mother kangaroo can have another joey born and the cycle begins again.